The Seafood Shanty is now entering it's 22nd season. Prior to becoming The Seafood Shanty it was a seasonal clam shack established in the late 1950's. 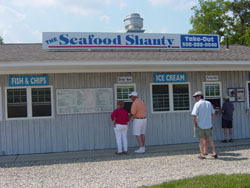 The Seafood Shanty first opened in the spring of 1992. The Seafood Shanty Philosophy: " To provide the freshest ingredients possible, home-made recipes, all our food is cooked to order, with friendly service and reasonable prices." Deck: "Suspicious activity" regarding your social security account?Towns: BarnstableBourneBrewsterCentervilleChathamCotuitDennisEasthamFalmouthHarwichHyannisMarstons MillsMartha's VineyardMashpeeNantucketOrleansOstervillePlymouthProvincetownSandwichTruroWarehamWellfleetWoods HoleYarmouthTopic: Police and Fire NewsHub Category: Police and FireAuthor: CapeCodToday StaffTeaser: "Suspicious activity" regarding your social security? Deck: Runs 1/2 hour before sunrise to noon - Season Ends May 25thTowns: BarnstableBourneBrewsterCentervilleChathamCotuitDennisEasthamFalmouthHarwichHyannisMarstons MillsMartha's VineyardMashpeeNantucketOrleansOstervillePlymouthProvincetownSandwichTruroWarehamWellfleetWoods HoleYarmouthTopic: NewsHub Category: OutdoorsAuthor: CapeCodToday StaffTeaser: Runs 1/2 hour before sunrise to noon - Season Ends May 25thMain Image: Main Image Credit: Hunting? BOURNE ? The union representing Bourne firefighters has sent a letter to the board of selectmen informing them that the membership has voted no confidence in Fire Chief Norman Sylvester. Sylvester was hired as chief in 2015. The union says he has repeatedly jeopardized safety and has provided inadequate training? .